The historic Walled City in Old Delhi is an obvious tourist attraction, but presents big problems. During daytime and right into the evening, the place is packed with fellow humans and animals. Sauntering along the ancient streets is not an unalloyed joy. 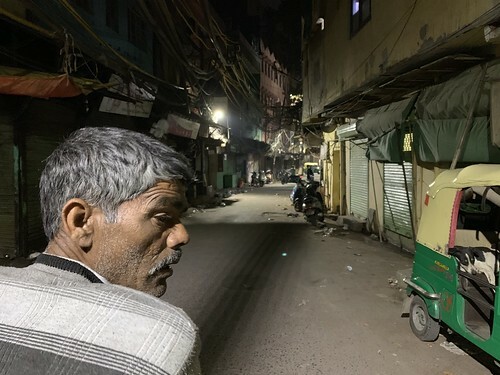 One viable option is “doing” Old Delhi when almost everybody’s asleep, say, at 4 am. You’d probably want to catch a rickshaw because the street dogs—quiet and sweet-mannered during the day—do tend to snap at passersby. And, yes, rickshaws are definitely at your beck and call even at this early hour because they work in shifts. Ask your rickshaw puller to take you across random streets and lanes that include the historic Lal Kuan neighbourhood—with its dilapidated but gorgeous structures. The streets that are otherwise so tumultuous are finally resting, like a chatty hyperactive uncle who is now asleep and snoring. 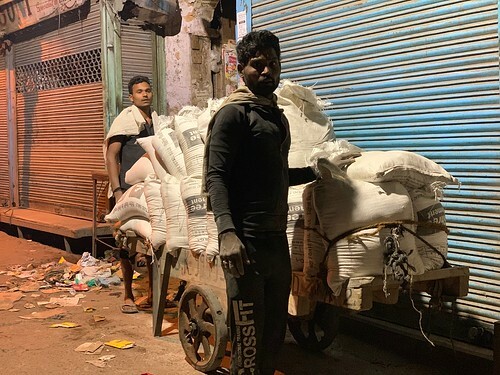 Hardly noticeable during the day are multitudes of rats the size of kittens, now brazenly sorting through garbage, undeterred by the approaching rickshaw. Parts of these lanes are bathed in the pale orange glow of streetlamps, while other portions are submerged in complete darkness. The effect is magical, as if you are wading through a gloomy painting by some renaissance painter. 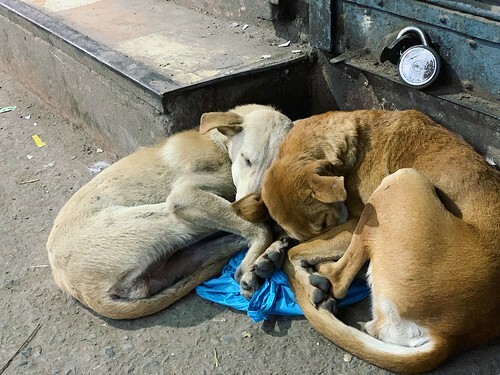 In Ballimaran, the rickshaw passes by a cute sight of two dogs sleeping in the posture of a longtime couple, with their faces touching each other. 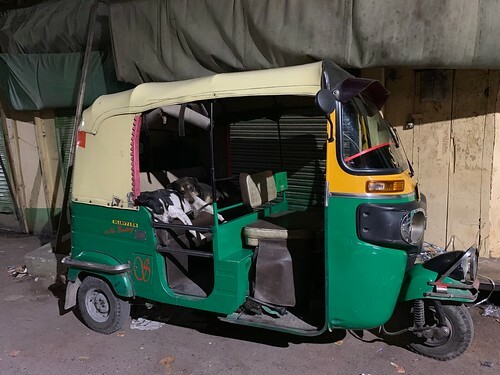 Two other dogs are fast asleep on the passengers’ seat of an auto-rickshaw. 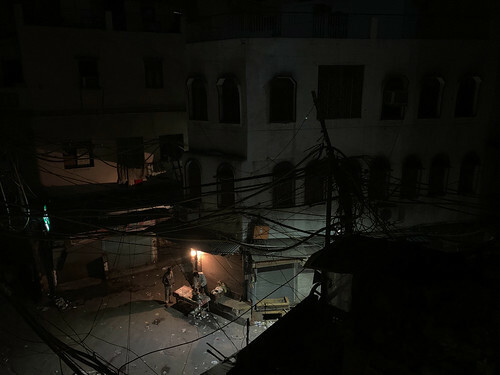 As dawn nears, the sleeping world in the Old City begins to stir. 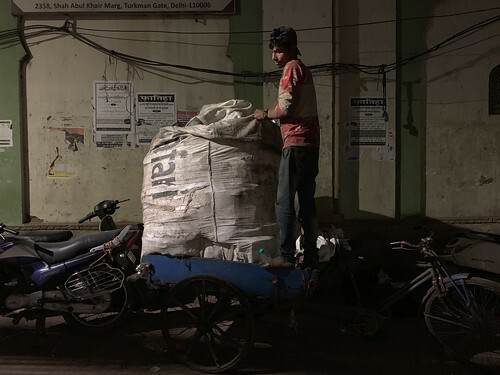 A rag picker is slowly picking his way with a gigantic sack on his burdened back; while further along stands a mini-truck packed with gular leaves as suitable feed for goats. That kind of vehicle would never be able to enter the congestion of Galli Chooriwallan during the day. In Chitli Qabar, the night’s last tea stall by a footpath is finally winding down; the tea man is quietly washing the kettle and the pan. Some minutes later the faint chimes of temple bells resound in the distance. The many cries of azaans too begin floating out from the mosques. The stillness of the previous hours quickly dissipates. It is time to end the tour.